I just released my new product, NimbleText. Technically I guess it's in public beta now. This means you get the opportunity to be one of the cool kids performing beta testing. 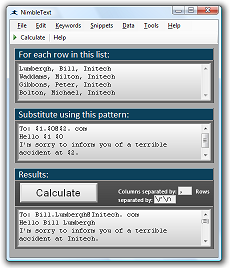 NimbleText is a downloadable version of 'the world's simplest code generator.' It's free, and adds a few features to the existing online version. If you register it, it adds more features again.